Take advantage of a variety of world-class musical offerings right on your doorstep here in Westchester! Check back soon for links to purchase your tickets. Free childcare is available for all concerts with advance reservation. Join us for a joyful afternoon of music! Featuring Clarinetist Pascal Archer and Pianist Adam Kent in works by Brahms, Poulenc and Leo Weiner. The CUUC Choir, Lisa N. Meyer, conductor and Georgianna Pappas, piano perform Schubert, Brahms, & Bernstein - including favorites from West Side Story, On the Town, and Candide. Free childcare is available with advance reservation. 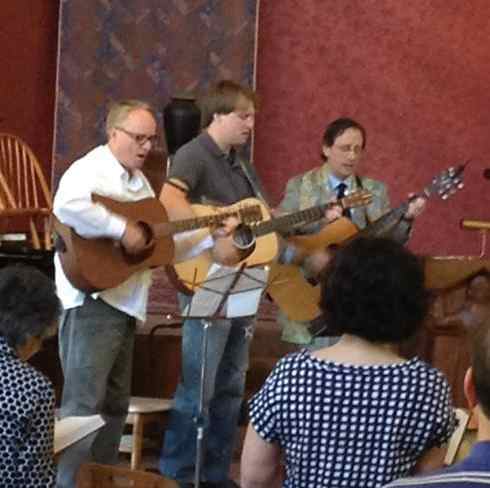 Join us for an afternoon of joyful, uplifting, and moving music. Mezzo-soprano Anna Tonna sings a program of sultry Spanish and Latin-American favorites accompanied by CUUC Music Director Dr. Adam Kent. And also featuring the CUUC Choir, under the direction of Lisa N. Meyer and pianist Georgianna Pappas, who will be performing the music of Harold Arlen. Favorites will include Somewhere Over The Rainbow, Get Happy, Stormy Weather, Accentuate the Positive and more. 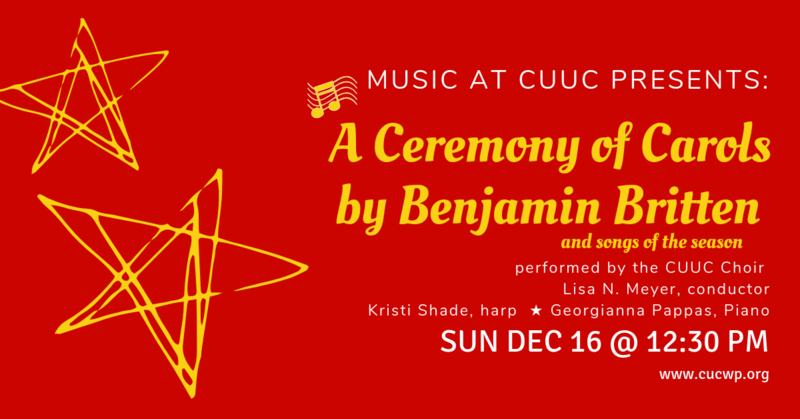 Our afternoon concert features the CUUC Choir, under the direction of Lisa N. Meyer, performing “Ceremony of Carols" by Benjamin Britten, with Kristi Shade on harp. 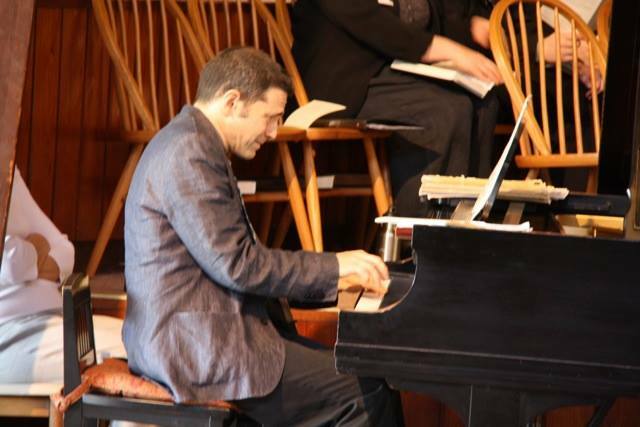 The concert includes seasonal favorites, with pianist Georgianna Pappas accompanying. A solo piano recital of works by Robert Schumann, including cameo appearances by Kim Force as Robert's fiancee Clara, and Craig Hunt as Friedrich Wieck, the couple's future father-in-law. Love, jealousy, and secrets abound in the piano music of Schumann. Join us for an insiders view. 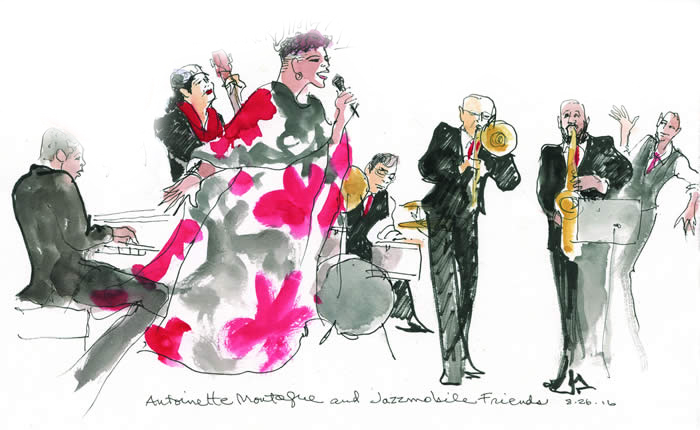 American Jazz and Blues singer Antoinette Montague returns with her band to CUUC for a special Valentine’s Day weekend show that embraces the power of Jazz history while maintaining the excitement of the present. Her repertoire of swing, blues, bebop, storytelling and explosive excitement promises to entertain and captivate everyone! You can learn more about Antoinette at antoinettemontague.com. Performed by the CUUC Choir, under the direction of Lisa N. Meyer, the afternoon concert features a performance of “Gloria” by Antonio Vivaldi along with favorite songs of the season. There will also be an appearance by the CUUC Children’s Choir, under the direction of Lyra Harada, Children’s Choir Director. Pianist Georgianna Pappas will accompany the choirs.